AT 05.30 today (June 21) the Islanders have exactly one week left in which to break the Guinesss World Record for rowing non-stop and unassisted around Britain. After battling for almost three weeks against storms, headwinds, trecherous tidal races, on-board breakages and not to mention military battle practice involving live ammunition, it all comes down to the next seven days. 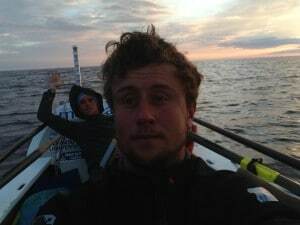 Skipper Josh Taylor and his crew – Alan Morgan, James Plumley and Gavin Sheehan – are now just over 400 miles from London. To break the world record that has stood since 2005 the Islanders have to row under Tower Bridge before 05.30 on Friday June 28. Yesterday, they had planned to ‘do the drop’ – to shoot straight south from Aberdeen to the Northumberland coast, a journey of 100 miles across open water. But yesterday off Aberdeen, they were battling against strong headwinds. Then, during the afternoon their watermaker, which converts seawater into clean drinkable water, broke down. Skipper Josh said last night: “After many calls back and forth with Gav’s dad [Adrian, who lives in Cork in southern Ireland] and some industrial duct tape it is back working! “Once again we’ve been slogging our nuts off to make distance in a force 6 headwind. We’re absolutely shattered but we’re making progress inch by inch. Meanwhile, in second place Josh Tarr and Jason McKinlay of Team Savoir Faire are making use of the southerly winds that have hampered the Islanders. They are now rowing at nearly three knots, just south of Ullapool and are hoping to reach Cape Wrath by the weekend, to begin their journey home.